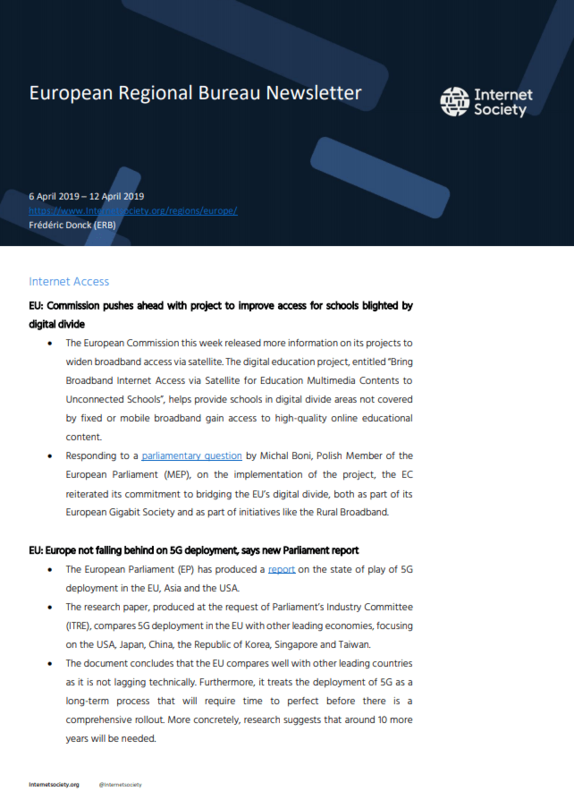 The European Commission this week released more information on its projects to widen broadband access via satellite. The digital education project, entitled “Bring Broadband Internet Access via Satellite for Education Multimedia Contents to Unconnected Schools”, helps provide schools in digital divide areas not covered by fixed or mobile broadband gain access to high-quality online educational content. Responding to a parliamentary question by Michal Boni, Polish Member of the European Parliament (MEP), on the implementation of the project, the EC reiterated its commitment to bridging the EU’s digital divide, both as part of its European Gigabit Society and as part of initiatives like the Rural Broadband. The European Parliament (EP) has produced a report on the state of play of 5G deployment in the EU, Asia and the USA. The research paper, produced at the request of Parliament’s Industry Committee (ITRE), compares 5G deployment in the EU with other leading economies, focusing on the USA, Japan, China, the Republic of Korea, Singapore and Taiwan. The document concludes that the EU compares well with other leading countries as it is not lagging technically. Furthermore, it treats the deployment of 5G as a long-term process that will require time to perfect before there is a comprehensive rollout. More concretely, research suggests that around 10 more years will be needed. Last Tuesday, representatives from the EU, Southern Mediterranean countries and industry met during the Digital4Med conference to discuss new ways of partnering for connectivity and data. The objective of the conference was to find ways in which the innovations brought by the European Digital Single Market can serve as a springboard for the transformation of the relations within the Southern Mediterranean Regions. Discussions focused on areas such as the identification of connectivity needs in the Southern Mediterranean countries; the promotion of public and private investment; closer cooperation on telecom matters and increasing the use of digital solutions in agricultural (smart farming) and other traditional sectors (smart factories and manufacturing). The Commission adopted last week a Cohesion Policy project of more than €573 million to boost the deployment of fast broadband in Italy. The funds will allow for faster Internet access to areas where it is currently not available. The project is embedded in the “Italian Digital Plan – Ultra-broadband”, the national strategy for Next Generation Access network. It aims at ensuring connection speeds of at least 100 megabits per second for 85% Italian households in all public buildings – particularly schools and hospitals. The United Nations’ Office for Disarmament Affairs has selected 25 countries to form a UN Group of Governmental Experts on Cybersecurity. Six of those are part of the European Union, including Romania, the Netherlands, France and Germany. Non-EU countries include: China, Russia, the USA, Japan and India. The group on cybersecurity is part of a larger UN GEE, the Group of Governmental Experts on Developments in the Field of Information and Telecommunication in the Context of International Security. The group is the key working group focusing on how international law and global rules apply to cyberspace. Diplomats from Australia, Estonia, the Netherlands and the UK have confirmed that they will also be joining the group in due course. BEUC, the European Consumers Organisation, has reacted with disappointment to Facebook’s recent decision clarifying its use of data for consumers. Ursula Pach, BEUC’s Deputy-Director General, stated that although the clearer terms and conditions were welcomed, they did not solve the problems inherent to Facebook’s business model, which “is built on the extensive exploitation and monetisation of people’s privacy, its market dominance in Europe and concerns about the company’s compliance with GDPR”. Pach’s concluding statement also underlined the groups disappointment about the investigation’s ambitions being limited to increasing the transparency on social media platforms and the regret that consumer organisations were not consulted in the process. The European Parliament’s Committee on Civil Liberties (LIBE) adopted this week its position on the terrorist content regulation with 35 votes in favour, 1 against and 8 abstentions. The proposed regulation lays down new rules mandating that platforms like Twitter or Facebook take down uploaded terrorist content within one hour of it being flagged by national competent authorities. On the removal deadline, the committee adopted a compromise mechanism that would allow 12 hours for the first removal order, and then 1 hour for the following ones. An amendment from the Greens political group to delete the one-hour deadline was deleted. European countries reached a general approach on the file in December 2018. However, several Member States expressed serious reservations about the proposal, particularly with regards to ensuring an adequate balance between security needs and fundamental rights. The whole parliament will now vote on the file next week. However, inter-institutional negotiations will not begin until after the elections. The proposal was also discussed at the G7 Interior Ministers meeting this week. Eurosmart, an industry group representing the cybersecurity industry, welcomed earlier this week the adoption of the Cybersecurity Act by European Member States. More concretely, they acknowledged the “courageous proposal from the European Commission, as well as the in-depth involvement of both co-legislators”. The association also expressed the conviction that the competences given to the EU Agency for Cybersecurity (ENISA) will be beneficial for the EU-wide operation to identify, prevent and tackle cyber-attacks and threats. Furthermore, the Cybersecurity Act establishes a Cybersecurity certification framework for ICT products, services and processes. In the eyes of Eurosmart, this certification will objectively contribute to the completion of the European Digital Market for Cybersecurity. The European Commission this week published its AI ethics guidelines which were prepared by its High Level Working Group on AI (HLEG). These guidelines, which aim to set out the key requirements to achieve “trustworthy AI” in Europe, were toned down significantly since the initial draft was published just before Christmas with many of the previous red lines watered down. The final guidelines emphasise the differentiated opportunities, challenges and ethical concerns arising from AI systems based on different cases and sectors. The Commission is now lunching a large-scale pilot phase for feedback from stakeholders on its assessment list aimed at implementing “trustworthy AI” which accompany the guidelines. Over the summer, the Commission will gather feedback with the aim of publishing a revised version in early 2020. The HLEG is also working on a set of “policy and investment” recommendations that will include suggestions for the ethical and legal framework for AI – however, it will be for the next Commission to decide how to proceed on any recommendations. The group of Special Advisers to Competition Commissioner Vestager published their report on the future challenges of digitisation for competition policy last week. In their 133-page final report, “Competition policy for the digital era”, experts called for changes to the way competition rules apply in the digital markets. They argue that characteristics of the digital economy make it difficult to dislodge “large incumbent digital players”. The report notes that access to data is desirable as it promotes competition. However, if disseminated too widely, data may hinder investment. As a result, major tech companies could face new antitrust challenges. The Commission will now discuss and debate the report before drawing any operational conclusions. After its adoption of the fake news law in late 2018, the French Government has now provided a clearer scope of the country’s legislation on disinformation in a ruling published in its official journal Thursday this week. The legislation will now apply to platforms “with at least five million unique visitors per month”. Furthermore, “transparency obligations will apply to content with a minimum spending of €100, excluding tax”.